Lol, who says I’m selling? I quite fancy taking these babies out for a spin myself! What you got on deck for that? I just logged out, but I’m pretty sure I used a draining boon comp, special gum, PBC3, and invigor paste. It will be awhile until I can attempt to make another one. My effectiveness was lowwww…like 36 or something. Yeah, effectiveness is very low, even with maxed stats. Take a look at my deck, noted in first post, I find the combination of corrupt boon 2 and defect reversal works best for low effectiveness. Can someone post pics of the actual bows? I wanna see the pretty. Logged off now, but I’ll post my citizen in its most Oortly, rift slingbow wielding pose once I’m back on! That Sling is DEADLY!!! NOICE work!!... I think the energy on the hammer may be a crutch… but would be very interested in the test results. Maybe if you adjusted energy skills and used energy brews and food may be good. If your forging rift into weapons/tools or anything thing other than refined/deco you should be slapped. Just saying. 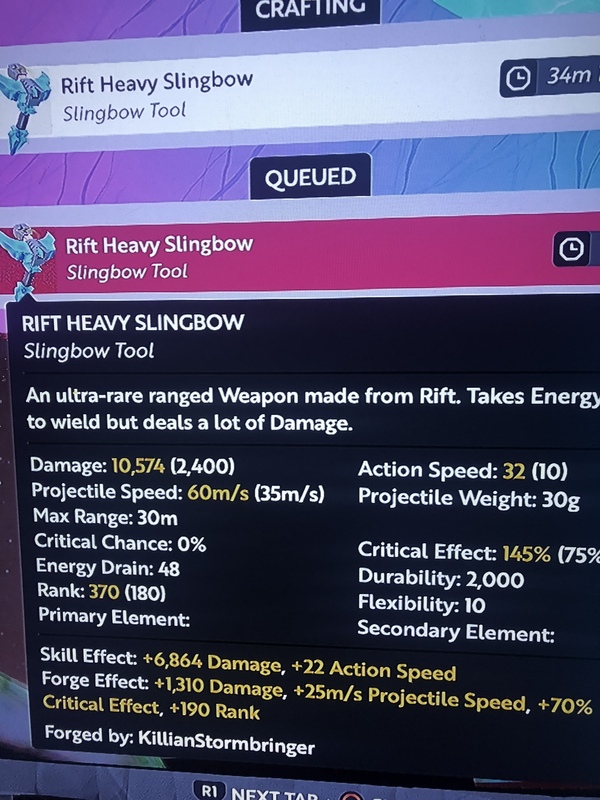 Rift is not even viable with such a low efficiency. If your game is making credits make it for building. People will buy it. I’d rather buy a weapon over the blocks. 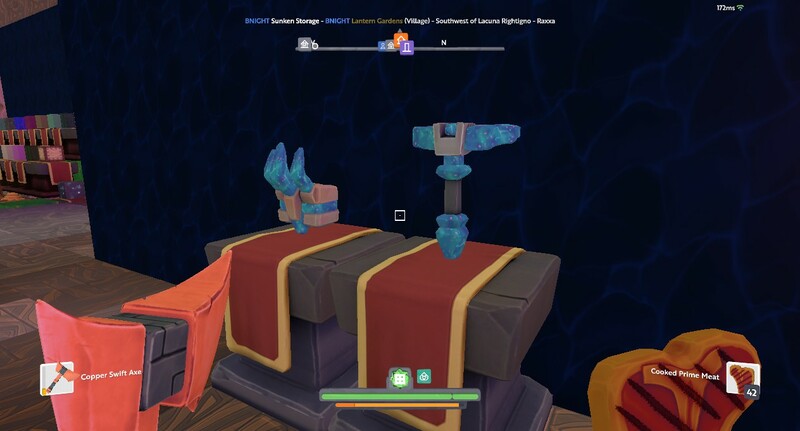 I think the blocks are a waste. The truth is I didn’t go for profit but here’s the brand new stuff I’d like to get some coin back. I’d also REALLY like to use these grapples but I have a mass craft coming so I’d sell but in a couple hours they’re going to get used. Though now I want to go take my rift hammers and scrape all the last rift from the t7s to make them into shovels and axes. Then go use them on some t1 planets. I’m enjoying tinkering with my new toys. BTW, if you have a sub account (or set one up, only takes 5 mins), you can send screen shots to that account. Then using the PS Messages app, you can d/l the screen shot and up load here, it’s how I done mine! Its a bit of a faff, but best way I’ve found. Lol I usually send a friend my screenshots and I usually get a “?? ?” Response lmao. I choose different people each time. I like to pretend my sub accounts are real people, occasionally replying to my screenshots messages.